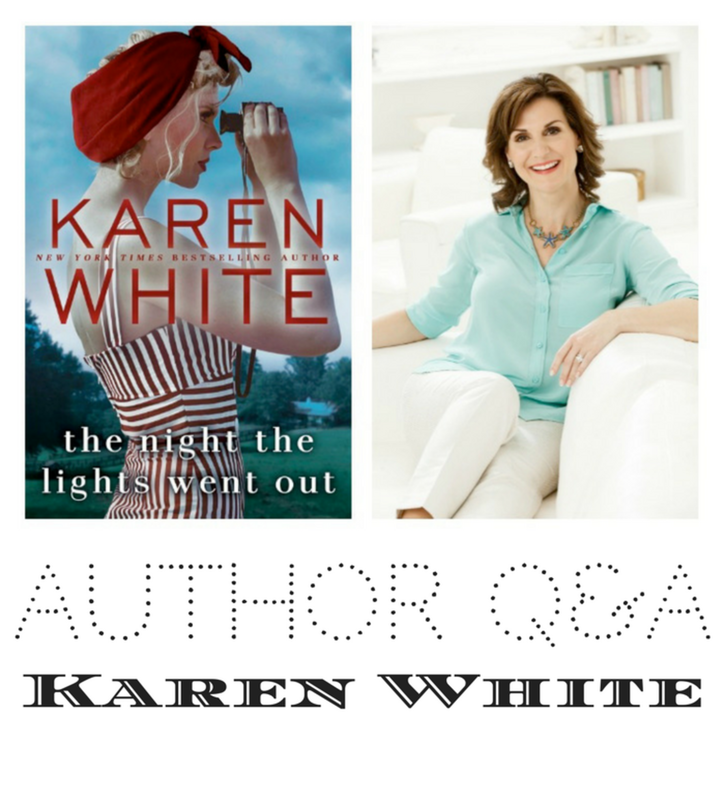 We recently caught up with New York Times bestselling author Karen White and chatted about her new book The Night the Lights When Out, available April 11. Pre-order your copy HERE! What inspired you to write The Night the Lights Went Out, which is set in the fictional Atlanta suburb of Sweet Apple, Georgia? At about the same time my daughter was doing work with the local historical society. She was telling me of the rich centuries-old history of our Atlanta suburban town. I nearly rear-ended a giant white SUV in a roundabout. The truck had about 100 stickers stuck to the back window. So within two seconds, I knew everything about the family who owned the SUV—including the driver. The license plate read YERSERVE. (Tennis is a big thing in the Atlanta ‘burbs.) I knew then I had the bookends for a burgeoning story idea set in my hometown. Merilee Talbot Dunlap is a recently divorced mother trying to get her life back on track. How does her decision to take root on Sugar Prescott’s farm help her to move forward? Moving into the cottage behind Sugar’s farmhouse is a big move for Merilee. It’s the first time she’s ventured out alone after her divorce, leaving behind not just her home and marriage, but her entire life. She’s starting from scratch, navigating life for the first time as a single mother of two. When we first meet Merilee, she’s lost, broken and disoriented. With Sugar’s sometimes reluctant guidance, she begins to find her own worth and strength. By the end, she has the courage she needs to face the biggest crisis of her life. How does writing the book in two time periods allow the reader to better understand both Sugar and Merilee’s personal struggles? I hadn’t originally intended to write the book in two time periods. When I started writing Sugar’s character I realized that to understand her, we needed to understand her past. And, what a colorful past it was! When we first meet her, we see a taciturn woman. She doesn’t have any need for all the newcomers to the town of Sweet Apple where she has lived for ninety-three years. But as we begin to understand her history with the town, we begin to understand and even empathize with her character. As Merilee’s own recent past comes to light, the reader sees why these two women have found a kindred spirit in each other. Why does Merilee actively pursue a friendship with Heather Blackford? I think Heather initiates the friendship. Merilee, feeling lonely and vulnerable, and perhaps even a little desperate, is easily persuaded to go along with all of Heather’s plans. I liken it to the feeling of being new in school and the popular girl invites you to sit at the popular table in the lunchroom. It’s hard to resist whether or not you feel like you belong there or even if you’ve ever wanted to be there. For Merilee, it’s a chance to fit in at a new school so she jumps at it. I’m currently working on another collaboration (as yet untitled) with Lauren Willig and Beatriz Williams. Our last collaboration, The Forgotten Room, was very well received and we’ve been asked to write another one. All I can say right now is that it is set on the Lusitania in 1915 and modern day, and it will be published probably in the fall of 2018.